The Ramayana is a guidebook, a sacred text, an inspiring scripture for every man in all lands, whatever his creed or condition might be. It imparts poise, balance, equanimity, inner strength and peace. Peace is the best treasure, without it power, authority, fame and fortune are all dry and burdensome. Thyagaraja has sung that there can be no happiness without inner peace. The Ramayana and the Mahabharata are two most important epics of Ancient India. 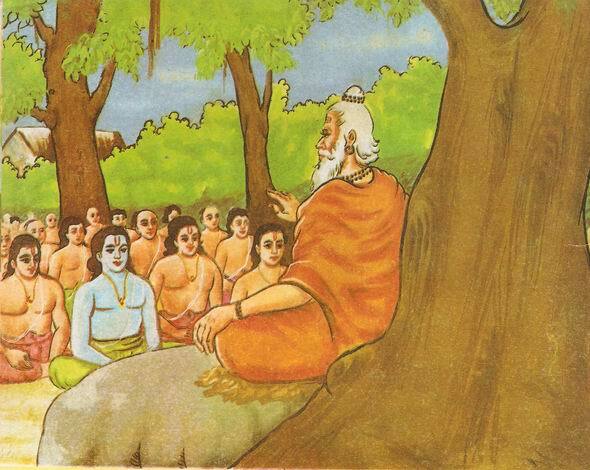 The Ramayana is the older of the two and was authored by Maharishi Valmiki at the instance of Sage Narada. The Word – Ramayana - means life-story of Rama. The original work was in Sanskrit, though later on, Saint Tulsi Das wrote it n Hindi poetry under the title Ramcharitmanas. Our series is, however, based on the original Sanskrit Text. In south India, Kamban wrote the Ramayana in Tamil while Kirtivasa wrote it in Bengali. 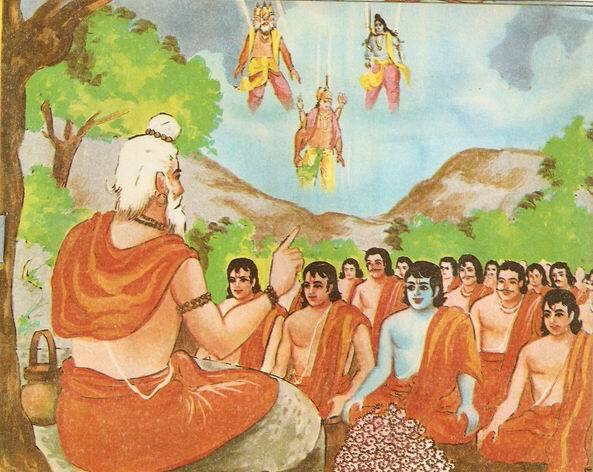 As remarked by Saint Narada, the Ramayana came to be a sacred book. People study it with deep devotion and reverence not only in India but in some countries of the Far East too. Because of its highly lesson-giving ideals, the Ramayana has been serving as a light-house for the people of India. Its ideals of true family-relationships, dutifulness, purity in thinking, tolerance and virtue are working a wonder even today in the face of polluting western influences which are more concerned with materialism than with noble values. 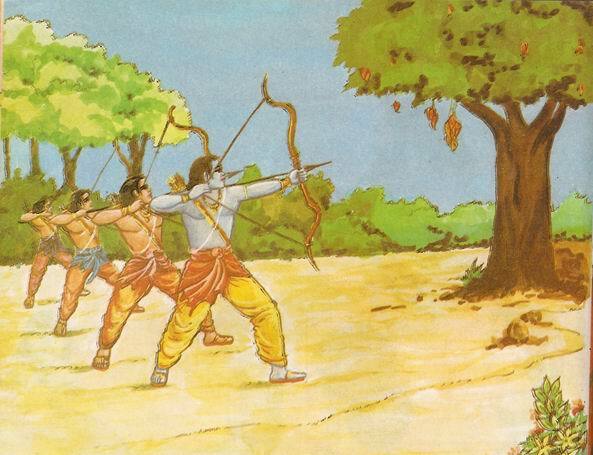 ‘Ramayana’ is an epic which needs no introduction as its story is well know to every Indian. Different versions and editions of ‘Ramayana’ are available in all the Indian languages as well as many of the foreign ones. But the format, in which we are present ‘Ramayana’, is unique. We are bringing out ‘Ramayana’ in twelve parts. The last two parts are based on “Lava-Kush” episode which is not found in mot of the editions of ‘Ramayana’. The exclusive feature of the present ‘Ramayana” is the importance given to pictures. The reason behind it is not only that young readers love pictures, but also that they find it easy to understand and learn the matter given in any illustrated book. No other edition of ‘Ramayana’ can claim abundance of multi-coloured attractive pictures like the one here. We are confident the labour and devotion, with which our artists and authors have worked on this project, will be appreciated. We also hope that the readers will oblige us by sending their valuable remarks. Long, long ago, there was a king named Dashrath in India. He had his capital at Ayodhya. He was a brave but God-fearing ruler who loved his subjects as his children. 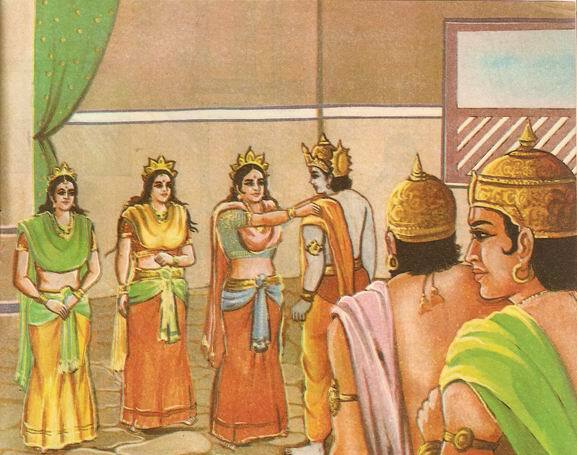 He had three queens named Kaushalya, Kaikeyee and Sumitra. The queens were very beautiful, pious and virtuous ladies. Dashrath belonged to the dynasty started from the Sun-god himself. 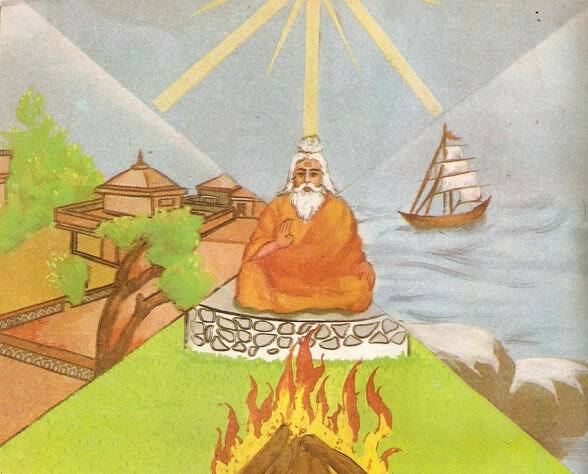 So, he worshipped the Sun daily as a guided by the royal priest who was named Vasishtha. In spite of the comforts of stately life, the king and his three queens were not happy. The reason was that none of the queens had given birth to any child so far. So, the kingdom was without a crown-prince. The King and the Queens were well past middle age. So, the king had lost all hope to be blessed with a son. “Who will succeed to my throne after me?” he often asked himself. The king folded his hands and said, “I am ready to do anything.” He, then, requested the royal priest to make arrangements for the son-granting worship. “This worship is to be performed by Saint Shringi. Go to his hermitage bare-foot and request him for it,” remarked Vasishtha. 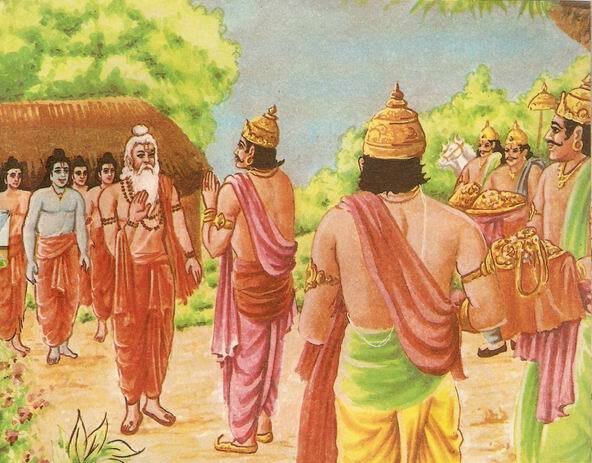 The saint agreed and accompanied the king to Ayodya. He performed the worship. As soon as it was over, the Fire-god appeared out of the fire with a pot in his hands. It contained the holy Prasad for the queens. “Your wish is granted, O king! Take this pot to you palace and ask your queens to share its contents,” said the god. Saying so, he disappeared. The king was very happy indeed. After the Yajna, Saint Shringi left for his hermitage. 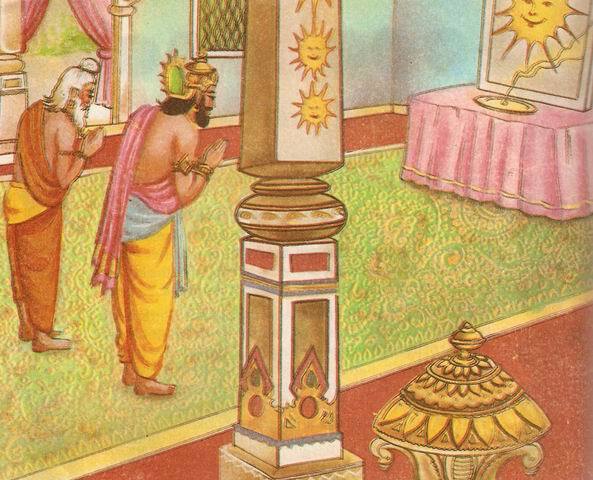 Seeking Sage Vasishtha’s permission, king Dashrath went into the palace. Seeing a pot in his hand, all the three queens cane running to him. They were very excited indeed. “What is there in this pot?” asked the queens. 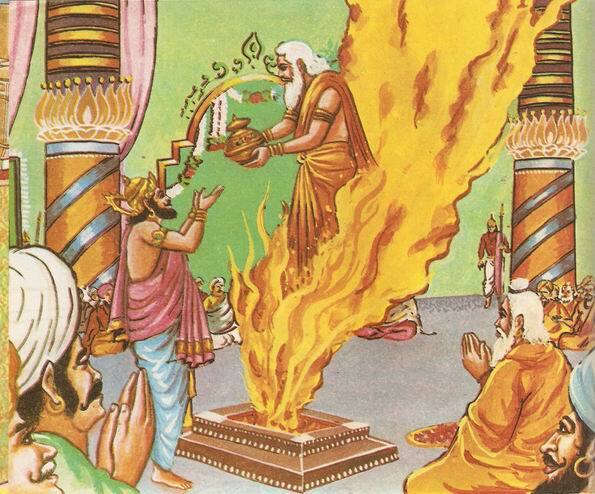 The king told them all about the Yajna and handed over the pot to Kaushalya, the eldest queen. Then all the three queens shared the Prasad as directed by Fire-god. Before long, th king got the news that all the three queens were in the family way. He was beside himself with joy. In his heart of hearts, he thanked the Almighty and both the saints as well. His wish was going to be fulfilled. Days rolled by followed by weeks and months. 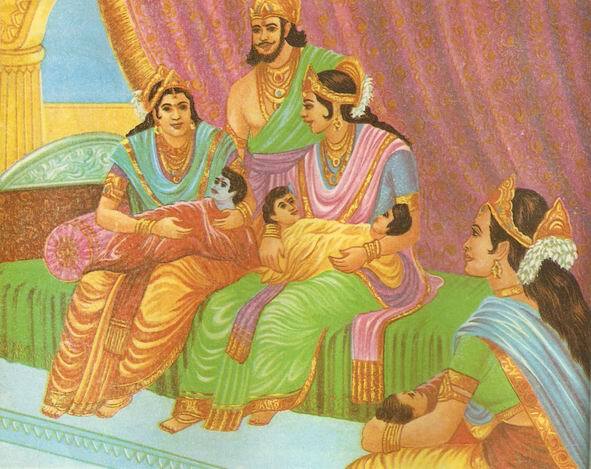 In time, approached the day of the births of four princes of Ayodhya. This auspicious day was the ninth day of the waxing moon in the month of Chaitra. The three queens bore four lovely sons in the evening. 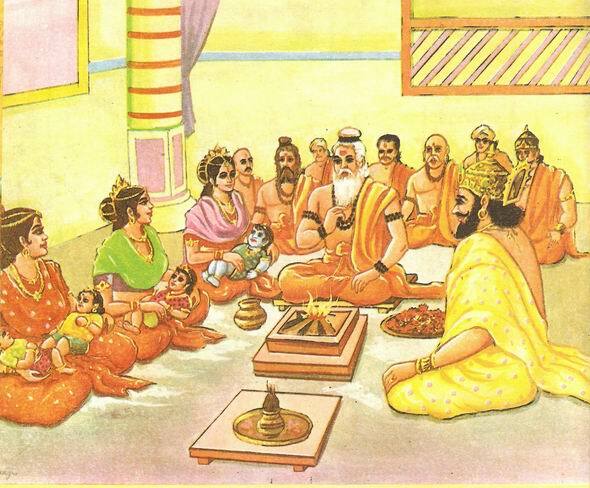 King Dashrath had become the father of four sons. 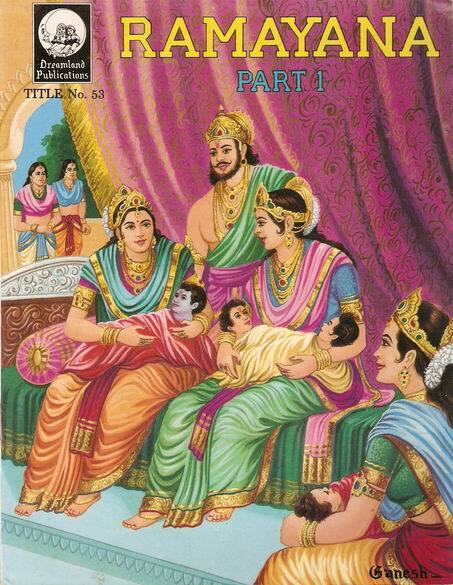 Kaushalya, the eldest queen, gave birth to one son and Kaikeyee too. 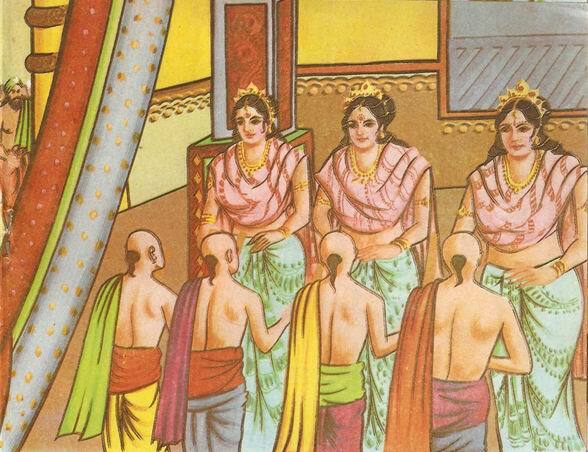 But Sumitra bore two male twins. The town of Ayodhya put on a new look and celebrations went of for a number of days. As for the royal palace, it resounded with shouts of joy. Everyone was happy at the births of the princes. The maids and attendants were given awards and gifts by the king and the queens. There was joy and bliss everywhere around. Festivities continued for days together on end. Bazaars and streets were profusely decorated with bunting and colourful gates. Rows of lit lamps were kept on the balconies at night. Ladies of the town were specially happy. They marched to the palace in groups singing joyful songs to congratulate the queens. 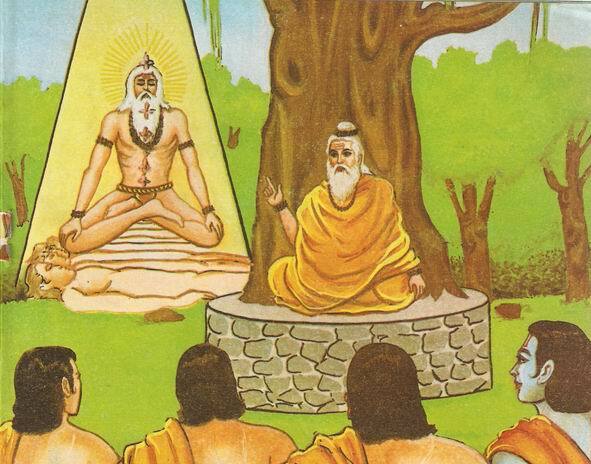 King Dashrath despatched a special messenger to convey the happy news to Sage Vasishtha. The Sage came to the palace to bless the new-born princes. A large number of sadhus and Brahmans were with him too. The king paid his respects to all the saints and gave them gold, clothes and cows in alms. Saint Shringi was specially honoured in a befitting manner. He blessed the entire royal family and the four princes in particular. Merriment and celebrations went on for over a month. When the princes were forty days old, their christening ceremony was held. The king requested Sage Vasishtha to suggest befitting names for the four princes. The royal priest (Vasishtha) performed the naming ceremony and named Kaushalya’s son Rama, the source of bliss. As for Kaikeyee’s son, he named Bharata – caretaker of one and all. “Queen Sumitra’s eldest son is born to destroy the enemies; so he should be named Shatrughna. Her youngest son is to possess the best of human qualities. So, he is to be named Laxmana,” said Sage Vasishtha. The queens like the names very much. They were indeed extremely delighted. Rama, the eldest prince, had a sallow complexion. But he was extremely handsome. The gold chain around his waist and the amulets on his arms added to his personal charms all the more. He was the apple of the king’s eye. All the three queens loved him most dearly too. 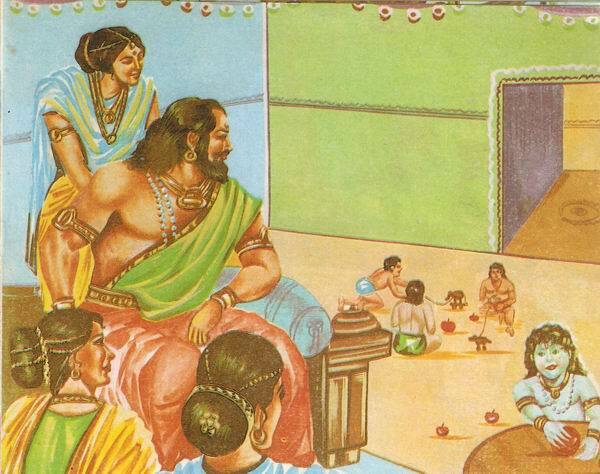 Rama’s movements and pranks were very fascinating indeed. He was the talk of the entire palace. Whoever saw him, he/she wanted to take him into his/her arms and fondle him lovingly. All the other three princes were fair-complexioned. The king and the queens were almost always lost in their dear sons. They fed them with their own hands and could ill-afford to let them be away from their eyes even for a moment. In due course, the princes grew young. The king requested the royal priest to perform their thread ceremony. This done, their formal education started. First of all, they were imparted training in shooting arrows. Rama was the most handsome and lovable of all the princess. He was cool-tempered and patient by nature. 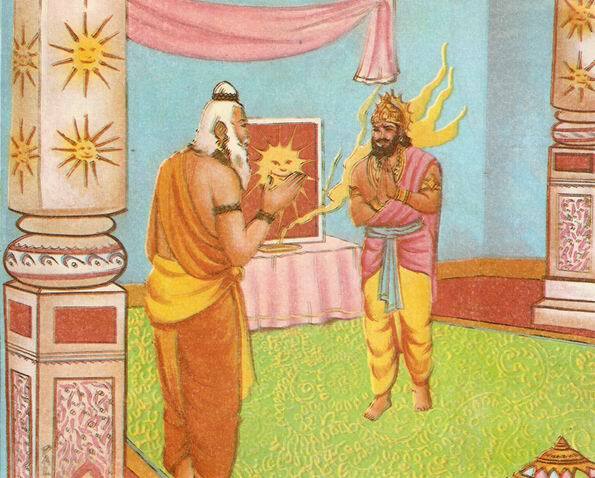 Lakshmana was more attached to Rama from the very beginning though he was quick to anger. As for Bharata and Shatrughna, they were very intimate. 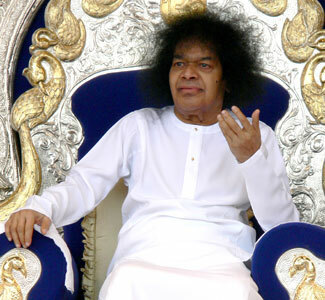 As the princes grew up further, the king decided to send them to the ashram (hermitage) of Sage Vasishtha for all-round education befitting the then princes. There they were to live as continents (brahmacharis) till the age of 25 years and attain knowledge at the feet of the great guru. The princes were soon informed that they were to go to the hermitage of the royal priest. So, they prepared themselves for that. Soon, they got their hair shorn and dressed up as continents in coarse clothes of saffron colour. 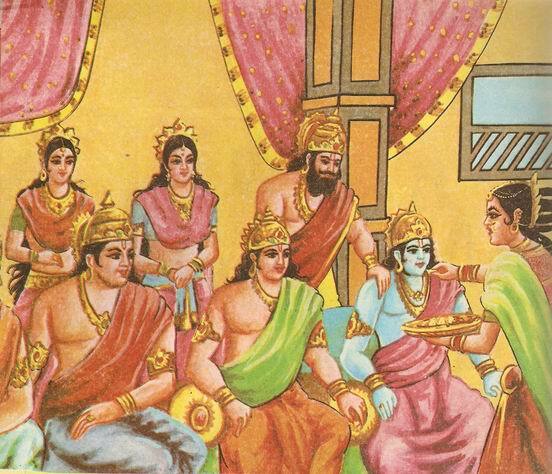 Then the princes, led by Rama; went to their mothers to seek their permission to leave the palace. The mothers felt shocked at the very idea of separation from their sons. But the family tradition was to be followed. So, they had to send them off but with heavy hearts and tears in their eyes. 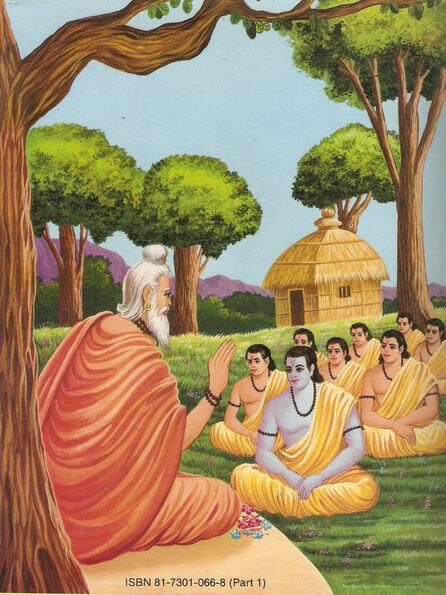 At Sage Vasishtha’s hermitage, the princes started learning various disciplines at the feet of the great teacher. The Sage imparted them knowledge befitting the princes of a great kingdom. The princes devoted themselves to studies and served the sage as humbly as they could. He imparted them to the knowledge of the three aspects of Gods power – Creation, Preservation and Destruction. Sage Vasishtha imparted instruction on state matters too to the four princes. Apart from it, he guided them in day-to-day worldly dealing as well. He explained to them the use of saam (allurement), daam (greed), dand (punishment) and bhed (division). Sage Vasishtha explained to the princes that human body is made up of five elements – air, water, fire, earth and space. Also, that man is the supreme creature among all living-beings. The princes took an oath to follow the instructions of the great teacher to the letter. They were now well-informed to step into the life of house-holders. The princes were just nearing the end of Brahmacharya period. So, Sage Vasishtha decided to teach them the duties of a good ruler and the art of state-craft. “In short, if a king is greater than his people, his duties are far heavier and harder too,” said the great Sage. The education of the princes having been complete, Sage Vasishtha sent message to king Dashrath. The king at once followed that the sage wanted the princes to return to Ayodhya. So, he sent Sumanta, his prime minister, to bring them home. Sumanta collected stately robes for all the four princes and got ready to go to the hermitage of the sage. The queens were very impatient to see the princes. 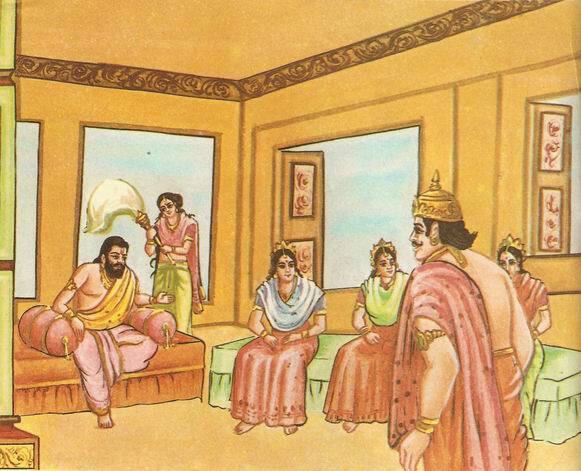 The queens asked Sumanta to return without delay along with their sons. The king and the queens sent presents for Sage Vasishtha and other students of the ashram as well. 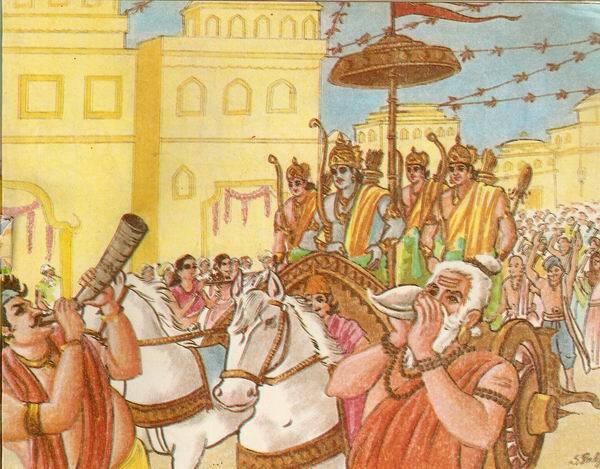 Sumanta left Ayodhya in a chariot promising the queens to return soon with their sons. Sumanta reached the hermitage of Sage Vasishtha and touched the feet of the great teacher. He paid respects to him on behalf of the king and the queens also. Then folding his hands, he stated the purpose of his visit. “I have taught you all I could. You must translate all my teachings into your day-to-day life. You shall be able to prove yourself to be good men. Not only this, you will be successful parts of the state-machinery also. Sage Vasishtha was indeed very pleased to hear what the princes had said. The princess put on the stately robes that Sumanta, the prime minister, had brought for them. 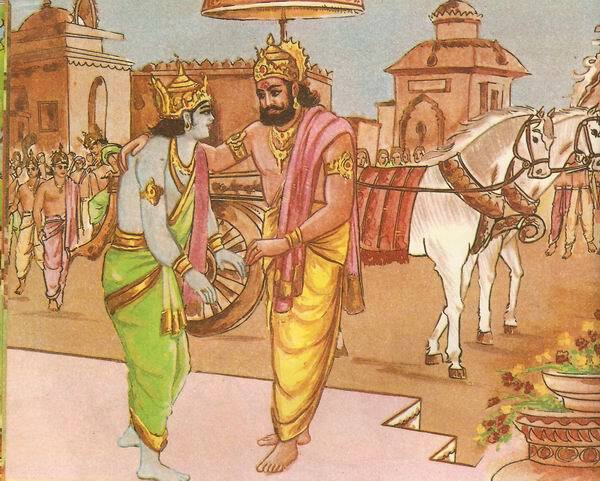 Then they left for Ayodhya in his chariot. Soon, they reached their capital that had been nicely decorated in their honour. 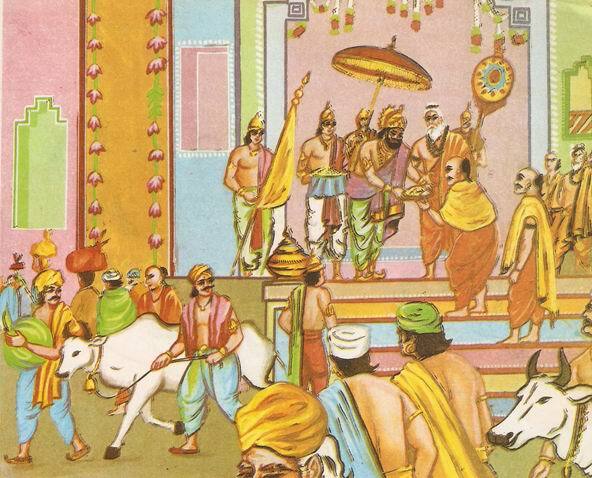 People of Ayodhya thronged to welcome their princes who had returned after a number of years. Everybody was impatient to have a glimpse of the princes. Rama, the crown-prince, was the chief attraction for one and all. People hailed him with garlands and raised slogans in his honour. Soon the news of the return of the princes reached the palace also. The king and the queens became impatient to see their dear sons. They had fixed their eyes at the gates of the palace. Soon a maid came running and informed the king of the arrival of the princes. King Dashrath was unable to control himself for joy indeed. He moved towards the gate to receive the princes. Choked with emotion, the king took the princes into his arms and kissed them one by one. He asked them to go and pay their respect to their mothers. So, the princes made for the chambers of their mothers who were waiting for them impatiently. 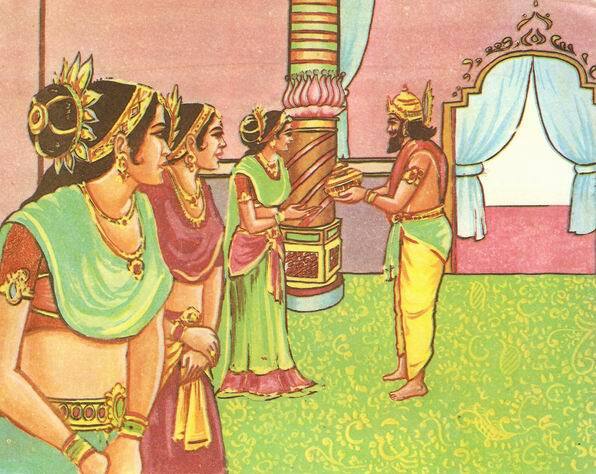 As soon as a maid came running in to inform the queens of the arrival of the princes, Kaushalya took off her necklaces and gave it away to the maid as her reward. Just them the princes entered the chamber where the queens were waiting for them. Seeing them, Kaushalya could not contain herself for joy. Rama first of all, touched the feet of Queen Kaikeyee who embraced him out of affection. The princes paid their respects to the three queens one by one. Tears of joy had welled up in the eyes of the three queens who had seen their sons after many years. They kissed and fondled them as if they were small boys. The day of the princes’ arrival was celebrated as a festival. Alms were given to the poor generously. Presents were sent to the saints and Brahmans. Blessing kept pouring in all day from all quarters. Everyone prayed for the long life of the princes. Kaushalya fed them with her own hands. Festivals went on for some days. Then the princes took to their daily duties. They got up in the morning and paid respects to their father and mothers. Then they got ready to attend the court. Rama, being the crown-prince, disposed of the state-matters entrusted to him. His brothers helped him in his task. The king was very pleased to see the princes going over their daily routine so carefully. 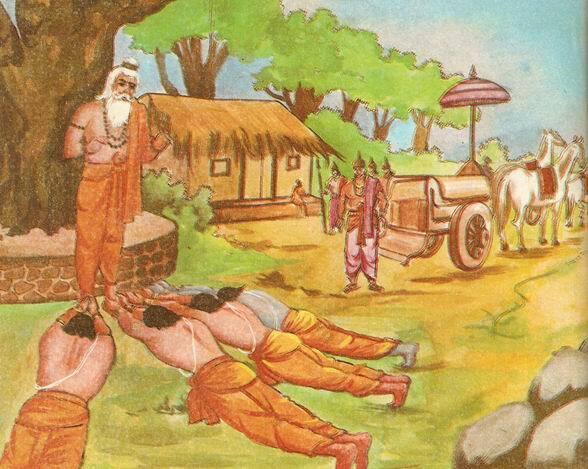 He was especially delighted to see Rama doing his duties for the good of the people who loved him very dearly. This is going to be wonderful, I really enjoyed this first part and am anxiously awaiting the next.........keep um coming, as you know, I need all the help I can gather at present. I have posted this conversation between Swami and Prof Anil Kumar, as it relates to the Ramayana.